Auto-ID Engine - GAO RFID Inc.
GAO Auto-ID Engine serves as the core of all GAO’s RFID and barcode software systems, our Platform for Rapid Development of Auto-ID Systems, GAO Auto-ID builder, as well as our Auto-ID Cloud Services software. GAO Auto-ID Engine is a Windows service that provides runtime interfaces for RFID and barcode readers, business modules and data synchronization. It is based on GAO’s extended middleware core with a library of extension modules and drivers as described below. GAO Auto-ID Engine facilitates rapid and efficient development of small to very large scale robust auto-id systems. Provides a reader device abstraction layer that has a common API for active and passive RFID readers and barcode readers that need to connect to the middleware during runtime. A vender specific reader can implement a reader abstract class to interact with other RFID and barcode components. Provides a business logic abstraction layer that enables various business specific module to plug into the RFID system by implementing a business module abstract class. Provides out-process integration for devices that are not resident in the RFID Engine process such as handheld reader devices or embedded reader devices. The component provides local data for embedded and handheld reader devices with the latest required information such as location information, reader configuration or user data. Also, it uploads RFID reader activity data to the GAO RFID server. Provides end user and administrator interfaces via Internet and Intranet. The component enables system administrator to manage RFID server, users, RFID devices, tags, and access system reports from a Web browser interface. The ERP module provides an interface to most major enterprise ERP systems such as SAP, Oracle, Microsoft’s Dynamics ERP, Infor and Epicor. In addition, GAO provide hooks into many other existing ERP software. 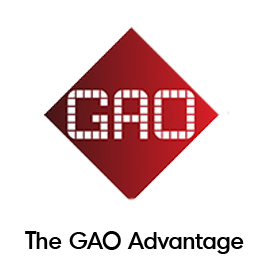 As well, GAO also offers its own full featured ERP system. Provides scheduled reports and complex report generation from the backend. GAO Auto-ID Engine can be deployed in the distributed network environment (Internet/Intranet) with center and site databases. Databases are synchronized with data replication services. The database are instances of Microsoft® SQL server instances that host center and site database table schema, stored procedures and data. The components also host business specific tables for ERP data, activity transactions and report data. Provides user interface based on business specific specification. Each handheld device will have a local database with required information for supported business modules. The local database is updated with a configured server with wireless or USB port. The device stores RFID transactions to the handheld database and uploads transactions to the RFID server whenever the device is connected to the server. Provides RFID tag reading by using LLRP API, barcode reading, business logic specific processing, and data communication with RFID server using FTP, UDP and TCP protocols.